The late Jóhann Jóhannsson received an Oscar nomination for the music he wrote for Sicario, which surprised the hell out of me as it was an awful score - bland and uninspiring when heard outside of the movie, but an essential character in the film. 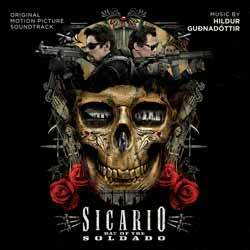 Sicario: Day of the Soldado is pretty much more of the same. Personally I don't think it's an album that deserves a stand alone score release. The score's 14 tracks (36 min, 41 sec) represent, on the whole, atmospheric background cues. If ambient, going nowhere sounds are your thing... you'll be able to fill your boots here. For everyone else who has normal hearing this is a rather strange, not to mention dull, experience. As I mentioned before, I'm sure it's a great tension builder in the movie, but I'd be seriously worried about the mental well being of anyone who spent time listening to this for recreational purposes.